It's a wide angle shot. A man is seen opening a gate, dressed in rags and smoking a beedi. A terminally ill disease writ large on his face. Precisely on that frame appears the Sanskrit term shruthi bedham, coupled with an off screen voice, an undoubtedly inauspicious start to any debutante�s first screen appearance, especially in the maiden frame. The film was Apoorva Raagangal (1975). The film itself was thick in controversy, and nobody took notice of the young newcomer, who was on screen barely for fifteen minutes, muttered a few apologetic words to the wronged woman and ultimately died an unsung, unheroic death. No one in the audience, even in his wildest imagination, would have thought this nondescript man, who had won the least attention in the film would ever win over millions of hearts in Tamil Nadu. Or ride the state like a colossus. Or even that his sway over the masses would be so intense that he could rewrite the fate of Tamil Nadu politics, exactly two decades after the release of his first film. K Balachander, the director who has an uncanny knack of creating stars, first met Rajnikant at the film institute, where he was a student. Balachander glanced at the dark young man and crisply asked him to meet him in his office the next day. When Rajnikant walked into his office gingerly, Balachander informed him he was going to act in his next film. Overwhelmed by the sudden offer from a �big� director, Rajnikant just could not believe his ears. It�s a feeling Rajni still recounts whenever in the mood of reminiscence. Later, Balachander confided in his close friend and associate Ananthu, �Watch out! There is a fire in the young man�s eyes. One day he will take Tamil Nadu by storm.� How true the prediction turned out! Producers went all out to capitalise on this new �wonder� called Rajnikant, and a string of films projecting him as an anti-hero, with all his stylish mannerisms in full swing, were released in quick succession. Rajni had, by now, become an indisputable star in his own right, a force to reckon with. Though Rajnikant persistently refers to K Balachander as his �guru�, it was director SP Muthuraman who actually revamped Rajni�s image entirely. Muthuraman first experimented with him in a positive role in Bhuvana Oru Kelvikkuri, as a villain in the first half and a refined man in the second, accepting a woman with a child ditched by her lover. The success of Bhuvana Oru Kelvikkuri prompted SPM to make a mushy melodrama with Rajni as a hero sacrificing everything for his siblings, a role ideally tailormade for Sivaji Ganesan! That film was Arulirunthu Arupathu Varai, in which Rajni�s mannerisms were totally missing and he even appeared as an old man in the last few frames. Even while the film was in the making, Rajni had misgivings about whether the audience would accept him in tear jerkers of this kind. But the film got made and its box-office success made Rajni popular among women audiences, too. These two films were a turning point in Rajni�s career � he changed from an actor who merely enthralled the audiences, to one who also made them weep. The acceptance of Rajni sans his mannerisms proved he�d at last become an actor from a star. Around this time came Mullum Malarum, directed by J Mahendran, which established Rajni as a hero with a slight tinge of the negative. Rajnikant�s entry may have been humble, in an insignificant role but the success he achieved in a very short span was unimaginable. A popular Tamil magazine brought out a special supplement at a time when his still on the make, and, he presto, the magazine�s sales doubled with that issue alone. Such mass adulation, the thunderous rain of applause when Rajni delivered his lines, all put together, made him a phenomenon. It was at this point that Rajni realised the onus had been thrust on him. The fate of producers hinged on him alone. This sudden exposure to the glare of the media and the popularity and money he never imagined would be his, created a lot of stress in his mind. At that crucial time in his career when his market price had just begun to zoom, he decided to opt out of films completely, sending shock waves to his fans. Balachander, Kamalhaasan and his other well-wishers somehow, coaxed him into staying on. The second phase of his life started with K Balaji�s Billa, a superhit disproving the canard spread by detractors that Rajnikant was �finished�. He was accepted as a full-fledged hero. Billa was followed by a row of hits like Pokkiri Raja, Thanikkattu Raja, Naan Mahaan Alla and the all-important Moondru Mugham, in which Rajni essayed a triple role. Even two decades after its release, the last continues to be a box-office draw and Rajni�s fans can never tire of the thalaivar�s verbal clash with villain Senthamarai. K Balachander�s first home production, Nettrikkam proved to be yet another milestone in Rajni�s career. An analysis of Rajni�s career graph shows a remarkable absence of fits and starts. It has been a slow and steady rise to the very top. As Rajni sings in a hit song from Badshah, a man�s life may be divided into eight divisions. Rajni�s own career may be divided into three segments. The first as a villain, the second as a hero with negative traits, and the third and present phase, as the reigning czar of Tamil filmdom. With Rajni�s films fetching crores and his market price skyrocketing, the costs of production of his films became unmanageable. And Rajni has since had to stick to a one film per year formula, sometimes, he could do a film once in two years. The new trend where his films� collections exceed normal regional film expectations started off with Badshah, followed by Annamalai, Arunachalam, Ejaman, Muthu and Padayappa. It�s now an accepted fact that only a Rajnikant film can break records set by his own films. As an actor, Rajnikant�s greatest asset, apart from his style is his sense of humour and comic timing. Like Amitabh Bachchan is popular for his drunken soliloquies, Rajnikant is famous for his comic encounters with snakes, repeated umpteen times. In the early 80s, Rajnikant made a foray into Bollywood with Andhaa Kanoon, a superhit. But Rajnikant could not concentrate on Hindi films because he was already safely ensconced down South. He still made a few films in Hindi, to mention specially Chaalbaaz which had Sridevi in a dual role. Rajni also enjoys a special kind of popularity in Telugu films and his Peddarayudu (remake of Tamil hit Nattammai) seems to have broken all previous records. The Telugu version of Padayappa has been a money-spinner, too. Rajnikant became a trendsetter recently with his Muthu and its songs becoming a rage in Japan and now, Padayappa running to packed houses in the UK and USA. Basically a religious person, Rajnikant has always owned up his faith. �I was brought up by the Ramakrishna Mission and it�s from there that I have inherited this religious frame of mind,� he keeps saying. Even his films have him openly sharing his faith. In Arunachalam he mouths that famous line, �God decides and Arunachalam executes it.� His public meetings are always spiced with humour and embellished with anecdotes from mythology. Married to Lata, an English literature graduate, hailing from an elite Iyengar family in 1980, Rajni has two daughters who are carefully kept away from the limelight. Lata herself a versatile singer, now runs a school called The Ashram. The couple indulges in a lot of charity, the latest being converting his Raghavendra Kalyana Mandapam into a charitable trust to help the poor and needy. 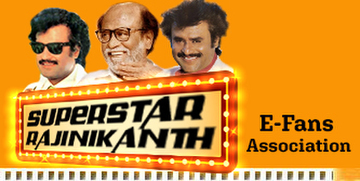 Ego and starry airs are unknown to Rajnikant. During breaks he hardly ever rushes to his air-conditioned makeup room. Instead, he prefers to sleep on the sets, even without a pillow, merely covering his eyes with a wet cloth. He never comes to functions with a retinue behind him and even prefers to drive his own car. A bit of a recluse, he may be at heart, but everyone who�s had the privilege of a darshan with the thalaivar has come away with a spring in his step, and a warm glow in his heart. Warm, friendly and affable, he�s the sort who deserves all the superstardom he�s earned. Such men, indeed, are rare.